A high school band director was suspended for a halftime show that reenacted the killing of police officers complete with fake guns and costumes. The band director works for the Forest Hill High School of the Jackson School District in Mississippi which has apologized for the spectacle. The school issued a press release explaining that the scene was based on "the movie John Q" which stars Denzel Washington in a thrilling hostage situation. School superintendent Dr. Errick Greene said, "I want to offer my deep and sincere apologies for the performance by the Forest Hill High School band during Friday’s football half-time show in Brookhaven." 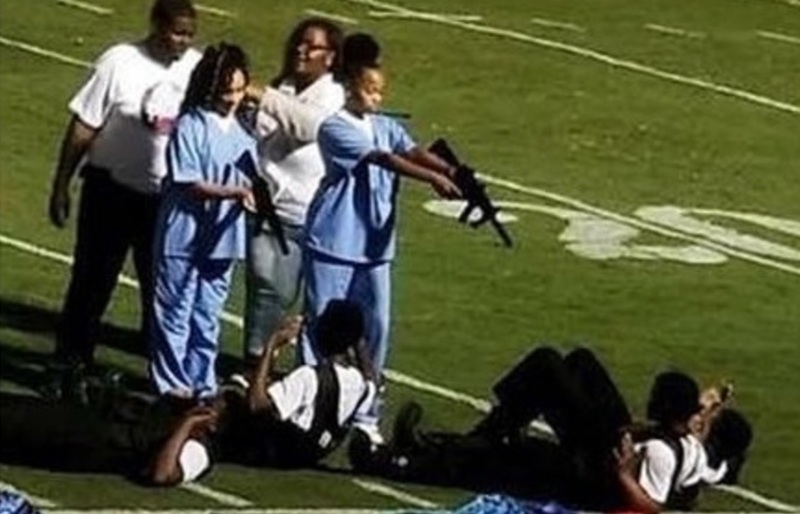 The halftime show depicted band members pointing assault rifles at other students who were dressed as police officers. The Forest Hill High School band director in Jackson has been suspended from his duties, according to the mayor following the public's response to the halftime show Friday. The real tragedy of the situation is the timing because the town just lost two Brookhaven police officers who were shot and killed just days prior to the halftime performance. Greene continued, "JPS has a great deal of respect and appreciation for our law enforcement partners. The band’s performance does not depict the values and people in our community, and was incredibly insensitive to the students, families, law enforcement officials, and the entire Brookhaven community." Greene added, "For this, we sincerely apologize to all, and we pledge to do better in the future. We have taken some initial actions in response to this matter, and you have my commitment that we will investigate it fully and take additional appropriate action with respect to procedures and personnel." Even Mississipi Governor Phil Bryant condemned the halftime show on Twitter saying, "This is unacceptable in a civilized society. Someone should be held accountable." The Brookhaven School District released a statement on Facebook that said, "The Brookhaven School District fully supports our local law enforcement. The halftime show performed by the visiting band during last night’s game was an unfortunate issue that our district had no prior knowledge of and does not condone. Our main focus remains, as always, on the safety of our students and the student-athletes performing on our fields. We appreciate our community’s support as we continue working to ensure a positive environment of sportsmanship for our student-athletes and those visiting Brookhaven." The Mississippi Department of Public Safety added their voice to those concerned with the halftime show through Commissioner Marshall Fisher who said in a statement, "The Mississippi Department of Public Safety is extremely disturbed by Forest Hill’s leadership approving and allowing their band to display a reenactment of violence against law enforcement at a high school football game in Brookhaven, MS. This is highly inappropriate considering the recent loss of two Brookhaven Police officers to senseless violence." Fisher added, "This only exacerbates the war against law enforcement in our nation. Mimicking acts of violence against law enforcement, or members of the public should never be condoned at a high school football game or any function whatsoever. The Governor’s School Safety Task Force is currently working to reduce school violence which is at an all-time high. I have to question whoever made this decision in regards to what message they are sending to our children." The Mayor of Jackson Chokwe Lumumba released a statement saying, "I offer my sincerest regrets to the Brookhaven community for the insensitivity that portrayed during the Friday evening halftime show. There is an active investigation into the circumstances that led to this performance. While I do not believe that there was a malice intent on behalf of the students that participated in this halftime show, I understand that we are ultimately not defined by the things that we set out to do, but rather how we respond to the things that actually do take place. It is the responsibility of adults to offer guidance to youth. Our students should have been instructed that this was neither the time or place for that performance." Aaron Banks, a Forest Hill graduate and current Jackson City councilman said, "As a councilman and graduate of Forest Hill High School, I deeply regret the performance of the Forest Hill High School Band this past Friday. It is very distasteful for us as a community of educators and leaders to not be aware, nor sensitive to the current negative portrayal and display of disrespect toward our Law Enforcement Community. We have to be very careful with what we allow, understanding that it was a presentation from the movie John Q, does not excuse the use of toy or play guns." Banks continued saying, "Especially when so many students, teachers, and first responders have lost their lives surrounding the same visual. It is my prayer, that we as a community we will continue to educate and foster an atmosphere conducive of a community who embraces and appreciates its law enforcement community and that we cast down anything that portrays the opposite. As leaders, we must evaluate the content of what we do, say and act out and what message it sends." I cannot understand why some idiots would allow this stuff to go on. The band director should be charged with a felony of some sort (there are thousands of charges available). What a bunch of stuff.